London present day and the city is about to vote in a General Election. Favourites are the Party headed by Socialite Edgar Carlton and his brother Xavier. They, together with the Mayor, Christian Holyrod, seem certain to be running the country soon. Detective Inspector John Carlyle has worked his way from constable but has never been seen as a team player. He is perhaps too honest and shuns the limelight. He and his sergeant Joe Szyszkowski are diligently and without fuss carrying out their duties. They leave the politics to their Superintendent Carole Simpson who is an administrator rather than embracing police procedure. They are called to a hotel where a murdered businessman has been found in his bedroom. They soon link this with another murder and realise that they were both members of a university club - the Merrion club. A note from the murderer states that all members of this club will be killed. Other members of this club include the Prime Minister in waiting, his brother and the Mayor. Switching between 1984 - 1990 and the present day. It shows why John has never been accepted by the majority of his colleagues. An old friend and ex-colleague Dominic Silver tried to recruit him and warn him he was going to be sidelined in the police. Dominic is now a successful businessman, a property tycoon and drug dealer. Carlyle is happily married to Helen and is always anxious not to upset her but they both are indulgent to their young daughter Alice whom they are putting through a fee-paying school despite the cost, and the main reason, that despite persuasions from the force, he refuses to retire. Carlyle and his Polish sergeant must try and identify the killer but are hampered by the Carltons who are determined not to reveal what went on in the Merrion Club, but also by Simpson who sees that allying with the probable new Government is preferable to supporting her staff. As you would expect from a journalist it is well written and researched. This is the first in a series to feature Inspector Carlyle and I found his character very appealing - a hard working and resourceful family man who probably regrets not taking up Silver's offer. 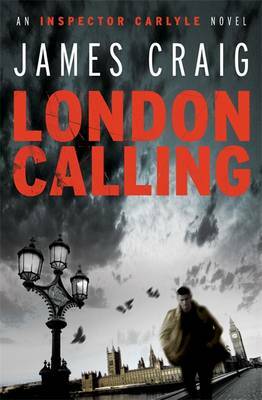 LONDON CALLING is a black comedy about power and corruption. Highly recommended.